Children and teens in the U.S. must navigate an environment saturated with junk food marketing. Everywhere children and youth go, marketing follows them, touting foods and drink that they would be much better off avoiding. The landmark 2005 report, Food Marketing to Children and Youth: Threat or Opportunity?, for example, found that most food and beverage marketing targeting young people promotes products that are high in sugars, fats, and salt, and low in nutrients, and that marketing influences children's preferences, purchase requests, and ultimately what they consume.1 Food marketers are doing everything they can to see that these trends continue as the media landscape changes, reaching ever more directly and intimately into children's lives. In the last five years, the digital media marketplace has grown dramatically, becoming an even stronger presence in the lives of young people.2 Marketing techniques and technologies have shifted accordingly, with an emphasis on a variety of new techniques. These include, for example, behavioral and location-based targeting methods that allow marketers to pinpoint their pitches, even sending personally designed promotional messages to individual consumers in real time. Critical areas of this program include "neuromarketing," or the use of such brain research techniques as functional magnetic resonance imaging (fMRI) to probe deeply into consumers' reactions to marketing; social media advances that tap consumers' networks of family and friends; and mobile services that allow marketers to bypass parents and guardians and reach children directly in real time at specific locations. Early concerns about the effects of food marketing barely touched on this rapidly changing digital marketing environment. To understand the scope and potential effects of food marketing targeting children and youth, public health advocates must understand the contours and dimensions of the global research infrastructure for digital marketing—especially the work focused on youth regarding food and beverages. Regrettably, scholarly research, much of it still rooted in broadcast technologies and traditional media like TV, has lagged behind developments in the field of online marketing. The Center for Digital Democracy and Berkeley Media Studies Group have closely followed how food and beverage companies and their network of partners are using research. Food marketers have invested in these efforts to ensure that their brands, many of which are low-density and high-fat products, are targeted to youth and take advantage of new media platforms such as social media, mobile phones, and online games. New commercially supported digital channels, including the Web, mobile, and gaming services, have already attracted huge numbers of children and adolescents.3 Other major platforms used for delivering food ads, such as TV, are being transformed as they incorporate many of the same interactive capabilities now found online.4 Precisely at a time when youth obesity is rising, powerful digital media marketing applications are undermining efforts to arrest the problem. Our study examined reports across a variety of formats and covering a diverse range of topics, including new platforms, online surveillance technologies, new metrics, and digital campaign awards. We also examined how this research was used in the campaigns themselves. For instance, the data obtained for this project included presentations by food and beverage companies in which they identified products, services, and strategies related to their own research and marketing plans. As we collected the research, we read each document, examining it for themes and the types of findings that were presented. Based on this initial assessment, we developed a classification scheme to organize the types of industry research. Using this system, we assessed each category to identify trends and patterns. Food and beverage marketing-oriented research using emerging marketing techniques includes some of the earliest work in the digital field. One of the pioneering studies from the U.S. digital marketing industry was the collaboration of the Microsoft Network (MSN), the Interactive Advertising Bureau (IAB), the Advertising Research Foundation, Dynamic Logic, and Marketing Evolution to evaluate whether online advertising contributed to campaign outcomes. The findings from their 2002 "XMOS Case Study: McDonald's Grilled Chicken Flatbread Sandwich" included the conclusion that "traditional media underdelivers to a segment of the consumer population who are reachable primarily through Online Advertising." The research also demonstrated that "online advertising promoted an increase in product awareness and image association. "6 McDonald's participated in this early study in order to better exploit the emerging digital marketplace. Overall we found that the food and beverage industry, together with the companies they contract, are conducting three major types of research. First, they are testing and deploying new marketing platforms, especially social and mobile media techniques, to reach consumers. Second, they are creating new research methods to probe consumers' responses to marketing, such as neuromarketing research to analyze users' deep cognitive and emotional reactions to advertising. And third, they are developing new means to assess the impact of new digital research on marketers' profits through analysis of sales, branding, and by developing new measurement metrics. We also found substantial literature on how the industry puts this research program into action, specifically through its efforts to target two groups—communities of color and youth (see the table for examples of research from each category). Next, we explain how research is being used to inform food and beverage marketing. New platforms research explores, develops, and tests new means by which to market food and beverages, often to children. Burger King was an early sponsor of interactive television (ITV) ads, for instance, collaborating with Verizon's FIOS service to examine cross-platform impact on engagement and sales.35 This revolutionizes the traditional 30-second TV spot because ITV permits two-way conversations between marketers and viewers, as well as "telescoping" ads that offer additional details on particular products and services. Additionally, the mobile and location marketing company Navteq has documented success for McDonald's, Domino's, and others who are pioneering the use of digital tactics to transform mobile devices into a service that effectively delivers consumers to a nearby store.37 Companies reach users on their mobile devices with ads targeted to a specific user in a particular location, and achieve an in-store sales opportunity by issuing digital coupons that can be redeemed at nearby stores. Industry researchers are also tracking the impact of "virtual products" connected to real brands. This is important because it illustrates the growing number of methods used to promote food products using techniques that likely have an impact on a young person's cognitive and emotional development. The ability of digital gaming to integrate real brands in the story, imagery, and design, for example, such as the Coca-Cola Kiosks that delivered "100,000 to 300,000 virtual purchases a day," seamlessly integrates the brand into young people's lives. Virtual characters, such as "Hello Kitty," were successfully used by McDonald's Hong Kong division to integrate the brand into the contact lists of users who exchanged millions of instant messages.38 The McDonald's effort combined the expertise of digital marketing research capabilities of leading digital technology and advertising companies. Microsoft Research, for example, plays a critically important role in advancing the capabilities of the Microsoft Advertising division. OMD, an international ad agency with over 140 offices in more than 80 countries and a key partner in the Hello Kitty campaign, has established its own digital marketing research lab. While varied in their approach and application, these techniques are all inter-connected in their contribution to the increased sophistication and effectiveness of interactive advertising. And for those concerned with the impact of such marketing on the public health in general and on children and youth in particular, understanding the subtle distinctions in these several approaches, and their collective impact on the evolution of advertising, is essential. The industry uses neuromarketing, which draws on brain research to craft messages that bypass our rational, conscious decision-making process, to promote food and beverage products, such as the award-winning effort by Cheetos for "Orange Underground. "40 That campaign involved neuromarketing by using a variety of research companies, especially Neurofocus, to analyze how to maintain Cheeto's market share with young people, and to build a new audience of adults who positively identified themselves as having child-like behaviors. New location-based measurement techniques made possible by mobile devices, and linked to product promotion and sales, have emerged as an integral part of the "path-to-purchase" consumer decision cycle, which is a major focus of marketing research. Digital marketing research has increasingly focused on the role of mobile and location-based marketing to help influence the purchasing decisions of consumers at all stages of the shopping process—both to stimulate and to maintain interest in a brand. Advanced work is also being conducted to expand the ability of marketers to collect and analyze data for behavioral profiling. The landscape of marketing is being dramatically changed through the rapid rise of so-called "real-time bidding" digital ad platforms, where the right to target an individual (usually 13 or older) is bought and sold in milliseconds. A new generation of interactive marketing specialists plays a role in this new system, which combines a wide range of data on a consumer, whether they are surfing the Internet, watching an online video, or using their mobile phone. Information collected from social media, such as profile data, is also used for such real-time targeting.41 There has been a dramatic growth in social media marketing data techniques, where brands (including food and beverage companies) can identify key online users and sites that favor their products. Naturally, researchers are interested in documenting how digital marketing delivers in-store sales. The industry spends substantial effort researching the effectiveness of its marketing, developing new metrics used to measure campaigns, and using these data to improve promotional strategies in near real-time. The research demonstrates that digital marketing techniques have a powerful impact on the decisionmaking of consumers. We found two major types of research in this category: works that developed new metrics by which marketing is measured, and studies that examined the efficacy of marketing. The latter were not exclusively on sales, but also included intermediate measures of success, such as how well a brand was perceived, or how long consumers "dwelled" on or spent time with the brand during an engagement. An innovative form of new marketing research methods the food industry uses is analytics, which involve "the measurement, collection, analysis and reporting of Internet data for the purposes of understanding and optimizing Web usage. "42 For example, in February 2011, Kellogg's presented its social media strategy at a BlogWell conference, demonstrating that it was familiar with many of the leading social media analytic tools, including Radian6 ("a complete platform to listen, measure and engage with your customers across the entire social web"), Cymfony ("provides market influence analytics by scanning and interpreting the millions of voices at the intersection of social and traditional media"), and Alterian SM2 ("empowers businesses with social intelligence to successfully engage with their target audience").43 Such information reveals both the range of techniques being deployed, as well as how knowledgeable these companies are about current digital marketing developments. Similar research has been used to test specific forms of digital marketing applications, including rich media, a digital marketing technique that uses a variety of interactive formats, including video, to foster immersive experiences for users. Such approaches are now being used to help design online coupons. Companies such as Coca-Cola and Pepsi have seen significant "lift" in store sales through rich media-enabled digital coupons.48 Other research demonstrates the positive impact on brand sales from the posting of images and videos on Facebook and similar social media. Rich media research also focused on the development of new metrics to measure its impact, such as the emerging concept of Dwell, which measures time users spend with the interactive components of an ad.49 This type of prospective work provides insights into how food and beverage campaigns will be constructed, as they take advantage of what emergent techniques are shown to be effective. Case studies submitted for digital advertising awards provide first-hand documentation by both companies and advertisers of the efficacy of many food and beverage efforts. Such case studies reveal the "insider" discussions about what both the brand and the advertising agency think about the product's success in the marketplace. These case studies are marketing tools by which the companies tout their ability to attract audiences and sell products, providing a window into the power of the new methods for marketing food and beverages to children and youth. For example, Frito-Lay's "SnackStrong Productions," in its submission to the Effie awards in 2007, documented the use of multiple forms of digital marketing to attract its youth target. The campaign reversed a decline in sales, with 7 million bags of the "mystery" X-13D Doritos chip sold during one phase of the effort—without ever showing a picture of the product or of any food. Similar research for SnackStrong-related efforts reveals multiple studies documenting the impact of various digital marketing efforts.50 The Effie submission illustrates a still-early example of how food and beverage companies have experimented with digital marketing techniques, documenting their impact on sales and other brandspecific goals. The food and beverage industry, with the market research industry, tracks young people to understand their media usage patterns and their consumption behaviors. These advertisers seek to benefit from farranging research into digital media, especially concerning their impact on youth behaviors. The industry knows that the current generation of young people—the so-called "millennials"—are more connected to media than ever before, and thus seek to exploit the marketing opportunities this connectivity provides. The collection of information on individual users based on both their online activities and a range of data records—so-called behavioral targeting—has contributed to the development of a variety of data-driven social media marketing applications. As with behavioral targeting, social media marketing techniques have been developed that can simultaneously foster and measure the activation and influence of individuals, including for food and beverage marketing. Advertising and marketing innovations are playing a pivotal role in the evolution of communications media, which now extend to online video, social media, and mobile phones. The expansion of advertising throughout emerging key platforms, such as those found in online video and location-based digital ad services, is still at a relatively early stage. But it is clear, based on advances in interactive advertising's capability to target online video users individually with personalized advertising, that such marketing will be a serious force in the lives of young people. Food and beverage marketers are engaged in a continual effort to document the impact of new marketing approaches, such as neuromarketing, mobile/location targeting, virtual worlds/video games, and online video. These new forms are extremely efficacious; they represent an important revolution in the marketing landscape. Yet they are also an extension of traditional marketing techniques (e.g., interactive television advertising), and are based on time-honored marketing principles (e.g., understanding and exploiting consumers' aspirations). For example, companies have long tried to reach influencers such as mothers; with the advent of digital social networks, however, marketers can focus on activating key influencers within groups of mothers, multiplying their marketing payoff. What is so potent, therefore, are the ways in which new digital marketing techniques, and research methods, allow for unprecedented precision in the real-time targeting of individual consumers, prominently including young people. Food and beverage marketers are driving powerful new forms of high-fat, low-density food consumption that can harm young people's health. Food marketers now have more channels to use in targeting young people, including videogames, mobile phones, and personal computers. They can launch, measure, and fine-tune in real time localized and national campaigns. Digital marketing enables food and beverage companies to use marketing techniques that tightly integrate play, gaming, entertainment, rewards (both virtual and "real"), and social relationships. Today, noncommercial actors such as young people's friends and social networks are designing marketing campaigns, helping create a branding environment not directly linked to the food or beverage manufacturer, and not necessarily recognized as traditional advertising. These marketing efforts on behalf of food and beverages can generate significant sales of products, without the expenditures normally associated with major campaigns. Sales can be generated without even showing the product itself. These campaigns are specifically designed to foster new forms of "social contagion" for products, text and video messages that are virally distributed, including by friends and those identified as "influencers." Marketers are now able to measure sales in stores and quick-service restaurants tied to digital campaigns. Food marketers are using these new approaches to orchestrate campaigns targeting individuals designed to initiate the "path to purchase," including promoting the idea to buy and then facilitating and measuring buying and post-consumption behaviors. Leading food and beverage marketers, their agencies, and digital marketing specialists are explicitly designing and implementing campaigns through neuromarketing efforts to influence emotional and subconscious brain processing. 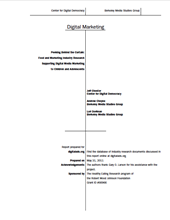 All of these developments are occurring in a still-early stage for digital marketing. Given the growing investment in digital advertising, ensuring that personalized interactive marketing is a core component of the new media landscape, what finally emerges in the next several years will have a significant public impact, especially on youth. This report and its accompanying online archive of industry research reports and case studies are designed both to serve as a resource for the field and also to help foster a broader discussion within the community of public health advocates and researchers focused on youth obesity. Along with related work done by the investigators and colleagues in developing a conceptual framework and research agenda to address food marketing in the digital era, this report, we believe, builds a foundation to support new and collaborative scholarly and public education efforts.70 We encourage researchers and advocates to review and assess the materials assembled for this report, which should lead to more informed strategies for further research and debate. Ongoing efforts to collect industry's marketing research will both create a record of how food marketers have used digital technologies and help the field keep abreast of the latest developments. This research report was supported by a grant from the Robert Wood Johnson Foundation's Healthy Eating Research program. 1. J. M. McGinnis, J. A. Gootman, and V. I. Kraak, eds., Food Marketing to Children and Youth: Threat or Opportunity? (Washington, DC: Institute of Medicine, 2005). 2. Although online spending is still a relatively modest percentage of food industry overall U.S. ad expenditures, it is increasingly regarded as one of the most cost-effective ways to reach and engage young people. Unlike a traditional ad buy on television, a more modest amount of money can buy millions of online ad "impressions." For example, Nielsen reported that just for the period of March 2-March 8, 2009, Kraft Foods, General Mills, and Unilever delivered 77 million, 62 million, and 54 million online ad impressions, respectively. Nielsen AdRelevance, "Data Glance: Leading CPG Advertisers, March 9-15, 2009, http://www.adrelevance.com/intelligence/intel_dataglance.jsp?flash=true&sr=36810. ConAgra, Mars, Pepsi, Burger King and Yum Brands all increased their Internet display spending in 2007 from the previous year. But due to the nature of Internet marketing, actual expenditures do not necessarily reflect the impact of an ad or a campaign, especially when it involves social media marketing, user-generated ads, and other forms of peer-to-peer creation and transmission, which are very inexpensive to implement. "100 Leading National Advertisers," Advertising Age, 23 June 2008, http://adage.com/article/datacenter-advertising-spending/100-leading-national-advertisers/127791/. See also "Internet Advertising Revenues at $5.5 Billion in Q1 '09," IAB, 5 June 2009, http://www.iab.net/about_the_iab/recent_press_releases/press_release_archive/press_release/pr-060509 (all viewed 7 June 2009). 3. Nielsen Company, "How Teens Use Media: A Nielsen Report on the Myths and Realities of Teen Media Trends," June 2009, http://www.fuelingnewbusiness.com/2009/06/27/how-teens-use-media-a-nielsen-report-on-the-myths-and-realities-of-teen-media-trends/ (viewed 24 Sept. 2009); V. J. Rideout, U. G. Foehr, and D. F. Roberts, "Generation M2: Media in the Lives of 8- to 18-year-olds," Henry J. Kaiser Family Foundation, 2010, http://www.kff.org/entmedia/upload/8010.pdf (last viewed 28 Dec. 2010). 4. Futurescape, "How Connected Television Transforms the Business of TV," 2010, p. 5, http://www.futurescape.tv/connected-television-white-paper.html (registration required). 5. See, for example, Advertising Research Foundation, "Current ARF Research Initiatives," http://www.thearf.org/assets/research-initiatives (last viewed 12 May 2011). 6. IAB, "Research Case Studies," http://www.iab.net/insights_research/1672/1678/1690 (last viewed 14 Apr. 2011). 7. Tetherball, "McDonald's Snack Wrap Mac Campaign," http://www.tetherball360.com/files/McDonalds_Case_Study.pdf (viewed 14 Apr. 2011). 8. Stephan Knble, "Benchmarking: The Great Leap Forward," GfK Consumer Tracking, May 2010, http://www.yasni.com/ext.php?url=http%3A%2F%2Fstatic.googleusercontent.com%2Fexternal_content%2Funtrusted_dlcp%2Fwww.google.com%2Fen%2Fus%2Fgoogleblogs%2Fpdfs%2Fgfk_germany_benchmarking_projects.pdf&name=+Knble&cat=document&showads=1 (last viewed 12 May 2011). 9. "Sprite and 360i Awarded for Best Social Engagement Campaign at the 2009 DPAC Awards," 360i Digital Connections, 14 Dec. 2009, http://blog.360i.com/360i-news/sprite-360i-receive-top-honors-2009-dpac-awards (last viewed 20 May 2011). 10. Zemoga, "Cheezdoodles.com Case Study," 2009. 11. Jeffrey Bardzell, Shaowen Bardzell, and Tyler Pace, "Design Lessons from User Generated Content: An Analysis of User Generated Internet Video and Flash Animations," OTOinsights, http://www.slideshare.net/OnetoOneInteractive/design-lessons-from-user-generated-content-an-analysis-of-user-generated-internet-video-and-flash-animations?from_search=1 (last viewed 20 May 2011). 12. MTV Networks Digital, "Subway 'Fresh Buzz' Social-Media Initiative: Insights from MTVN Digital & Meteor Solutions," Feb. 2010, http://mtvndigital.com/news/pdfs/MTVND-Social.pdf (last viewed 20 May 2011). 13. PointRoll, "Supervalu Drives in-Store Grocery Sales with Localized Expandable Rich Media Ad Campaign," Mar. 2011, https://wiki.pointroll.com/display/PRRC/03.07.11+Supervalu+Drives+In-Store+Grocery+Sales+with+Interactive+Display+Advertising (viewed 20 May 2011). 14. One to One, "Quantemo Delivers a Single Quantitative Measure of Engagement," http://www.onetooneglobal.com/insight/quantemo/what-is-quantemo/ (last viewed 20 May 2011). 15. Jeff Zabin, "Coke's New Marketing Platform Bubbles to the Surface," ViewPoints, Fall 2006/Winter 2007, http://www.edmblog.com/weblog/files/MyCokeRewards.pdf (viewed 20 May 2011). 16. Microsoft Advertising, "Advertise," http://advertising.microsoft.com/asia/advertise (last viewed 20 May 2011). 17. Advertising Research Foundation, "The Advertising Research Foundation Develops Standards For NeuroMarketing Research," 22 Mar. 2011, http://m.thearf.org/news?newsid=109 (last viewed 20 May 2011). 18. Microsoft Advertising, "Online Measures of Brand Engagement: Dwell Times Hold the Key to Success," 3 August 2011, http://advertising.microsoft.com/europe/dwell-on-branding (last viewed 20 May 2011). 19. Yahoo Labs, "Bangalore, India," http://labs.yahoo.com/Yahoo_Labs_Bangalore (last last viewed 20 May 2011). 20. Communispace, "Frucor," http://www.communispace.com/clients/clientdetail.aspx?id=636 (last viewed 20 May 2011). 21. IAB, "McDonald's/IAB Cross Media Optimization," 21 Oct 2002, http://www.iab.net/about_the_iab/recent_press_releases/press_release_archive/press_release/4585 (last viewed 20 May 2011). 22. Coca-Cola, "My Coke Rewards: Enter Your Code," http://www.mycokerewards.com/enterCode.do (last viewed 20 May 2011). 23. Acxiom, "Case Study: Yahoo: Turning Browsing Habits into Targeted, Large Scale Webvertising," 2010, http://www.acxiom.nl/SiteCollectionDocuments/White_Papers/UK_YAHOO!_CASE%20STUDY.pdf; Advertising Research Foundation, "Media Measurement in the Digital Age Forum," http://www.thearf.org/assets/media-measurement-digital-forum (both viewed 20 May 2011). 24. GfK Media Efficiency Panel, "Marketing Mix Evaluator: Cadbury's Chocolate Charmer Campaign Results," July 2010, http://www.scribd.com/doc/45468533/Cadbury-Campaign-Results-Dec-2010 (last viewed 15 Apr. 2011). 25. GfK Group, "Cross-media Increases Sales Significantly: GfK, Coca-Cola and Google Unlock the Secrets of Sales Effects from Cross-media Campaign Components," 17 Apr. 2009, http://www.gfk.com/group/press_information/press_releases/003844/index.en.html (last viewed 20 May 2011). 26. Jeff Cole, "How We Developed Our Global Social Listening Strategy," BlogWell, 2 Feb. 2011, http://vimeo.com/20289047 (last viewed 20 May 2011). 27. "Study by AOL's Platform-A and OMD Finds that Today's 'Supermoms' Pack 27 Hours of Activities Into 16-Hour Waking Day," 22 Sept. 2008, http://www.businesswire.com/news/home/20080922005512/en/Study-AOLs-Platform-A-OMD-Finds-Todays-Supermoms (viewed 20 May 2011). 28. "MOBI 2009 Best Of Show / Winner: Best Mobile Creative / Finalist: Best Mobile Branding: Fanta, Millennial Media," DM2Pro, 2 Sept. 2009, http://www.dm2pro.com/articles/20090902_1 (last viewed 20 May 2011). 29. Effie Awards, "Winners Showcase: Snack Strong Productions," 2008, http://www.effie.org/winners/showcase/2008/2772 (last viewed 20 May 2011). 30. AOL Advertising, "Audiences/Teens," http://advertising.aol.com/audiences/teens (last viewed 20 May 2011). 31. "NeuroFocus Receives Grand Ogilvy Award from The Advertising Research Foundation," 2 Apr. 2009, http://www.neurofocus.com/news/ogilvy_neurofocus.htm (viewed 20 May 2011). 32. Advertising Research Foundation, "Youth Council," http://www.thearf.org/assets/youth-council (last viewed 20 May 2011). 33. Microsoft Advertising, "Reaching Youth," http://advertising.microsoft.com/uk/reaching-youth (last viewed 20 May 2011). 34. Facegroup, "Coca-Cola Project Youth Hijack," http://www.facegroup.co.uk/casestudies/cocacola%E2%80%99s-core-fizzy-range-coke-hijack (last viewed 14 Apr. 2011). 35. Verizon, "What is FiOS TV?" http://promo.verizon.com/omk/fios.shtml (viewed 14 Apr. 2011). 36. Facebook, "Facebook Ads: Case Studies," http://www.facebook.com/FacebookAds?v=app_7146470109; "SAMMY 2010 Best Branded Social Media Video and Social Cross-Media Finalist: Kellogg Co. / Pop-Tarts," DM2PRO, 22 Aug. 2010, http://www.dm2pro.com/articles/20100823_2? (both viewed 14 Apr. 2011). 37. Navteq, "Domino's Pizza," http://navteqmedia.com/mobile/case-studies/dominos; Navteq, "McDonald's," http://navteqmedia.com/mobile/case-studies/mcdonalds (both viewed 14 Apr. 2011). 38. Robbie Hills, "Presenting SponsorRockYou," iMedia Connection, 3 May 2010, http://www.imediaconnection.com/summits/coverage/26617.asp; Microsoft Advertising, "Digital Advertising Solutions," http://advertising.microsoft.com/asia/WWDocs/Asia/ForAdvertisers/MS_advertising_APAC%20v5_090610.pdf (both viewed 15 Apr. 2011). 39. Yahoo Research, "Computational Advertising," http://research.yahoo.com/Computational_Advertising (last viewed 21 May 2011). 40. Advertising Research Foundation, "2009 ARF David Ogilvy Awards WinnersCheetos, NBA and Obama for America," http://m.thearf.org/news?newsid=174 (Last viewed 14 Apr. 2011). 41. See, for example, Esomar, "NeuroscienceTheory and Application: Extending Consumer Understanding," Esomar Summer Academy, Amsterdam, 8 June 2011, http://www.esomar.org/index.php/events-summer-workshop-academy-2011-seminar.html; "Social Media Analytics: Tracking, Modeling and Predicting the Flow of Information through Networks," KDD 2011 Tutorial, Stanford University, http://snap.stanford.edu/proj/socmedia-kdd/ (both viewed 16 May 2011). 42. Web Analytics Association, "The Official WAA Definition of Web Analytics," http://www.digitalanalyticsassociation.org/about (viewed 21 May 2011). 43. "BlogWell Austin Social Media Case Study: Kellogg Company, presented by Jeff Cole," http://vimeo.com/20289047 Radian6, http://www.radian6.com/; Cymfony, "About Us," http://www.cymfony.com/About-Us/About-US; Alterian, http://www.sdl.com/products/social-intelligence/ (all viewed 14 Apr. 2011). 44. Jon Gibs and Sean Bruich, "Nielsen/Facebook Report: The Value of Social Media Ad Impressions," Nielsen Blog, 20 Apr. 2010, http://www.nielsen.com/us/en/newswire/2010/nielsenfacebook-ad-report.html (last viewed 14 Apr. 2011). 45. comScore, "The Proof for Branding Online," http://www.slideshare.net/ARBOinteractivePolska/theproof-for-branding-online; Advertising Research Foundation, "ARF 360 Media & Marketing Super Council: Full CouncilKickoff Meeting," 19 Feb. 2010; Razorfish, "Feed: The Razorfish Digital Brand Experience Report 2009," http://feed.razorfish.com/downloads/Razorfish_FEED09.pdf (Last viewed 14 Apr. 2011). 46. GfK Media Efficiency Panel, "Marketing Mix Evaluator: Cadbury's Chocolate Charmer Campaign Results," July 2010, http://www.scribd.com/doc/45468533/Cadbury-Campaign-Results-Dec-2010 (viewed 15 Apr. 2011). 47. Knble, "Benchmarking: The Great Leap Forward"; Microsoft Advertising, "Check OutAn ROI Analysis of the FMCG Sector," http://advertising.microsoft.com/uk/online-research-fmcg-check-out (last viewed 14 Apr. 2011). 48. PointRoll, "SUPERVALU Drives In-Store Grocery Sales with Localized Expandable Rich Media Ad Campaign," https://wiki.pointroll.com/display/PRRC/03.07.11+Supervalu+Drives+In-Store+Grocery+Sales+with+Interactive+Display+Advertising (last viewed 14 Apr. 2011). 49. Vitrue, "Anatomy of a Facebook Post: Vitrue's Data Behind Effective Social Media Marketing," 21 Sept. 2010, http://vitrue.com/blog/2010/09/21/anatomy-of-a-facebook-post-vitrue%E2%80%99s-data-behindeffective-social-media-marketing/; Eyeblaster, "Using Dwell to Measure Advertising Effectiveness," Benchmark Insights, May 2010, http://www.mediamind.com/Data/Uploads/ResourceLibrary/Eyeblaster_Research_Global_Benchmark_Insights_May_2010.pdf (both viewed 15 Apr. 2011). 50. Effie Awards, "Winners Showcase: Snack Strong Productions," 2008, http://www.effie.org/winners/showcase/2008/2772; "Doritos/iD3," Contagious Magazine, http://www.contagiousmagazine.com/2009/08/doritos_2.php (both viewed 15 Apr. 2011). 51. VideoEgg, "Maximizing Brand Lift with Online Advertising," 2010, http://www.wpp.com/wpp/marketing/digital/maximising-brand-lift.htm (viewed 14 Apr. 2011). 52. Microsoft Advertising, "Doritos Drives Brand Engagement with Custom Xbox Games," 1 Apr. 2011, http://advertising.microsoft.com/doritos-xbox-live-games (last viewed 15 Apr. 2011). 53. OMD and AOL, "Living La Vida Rapida: Today's Parents Living a Double Life at Double TimeFocus on Global Moms," http://www.slideshare.net/StuRodnick/living-la-vida-rapida-global-moms-2008; Effie Awards, Winners Showcase 2010: Only in a Woman's World," http://www.effie.org/winners/showcase/2010/4576; Anne Massey and Johanna Campbell, "Listening To A New Generation: How Frucor Is Leveraging A Private Online Community To Understand The Gen Y Mindset," iMedia Connection, Sept. 2009, http://www.imediaconnection.com/summits/coverage/24449.asp; Facegroup, "Coca-Cola Project Youth Hijack," http://www.facegroup.co.uk/casestudies/coca-cola%E2%80%99s-core-fizzy-range-coke-hijack (all viewed 14 Apr. 2011). 54. Advertising Research Foundation, "Journal of Advertising Research September 2010," http://www.thearf.org/assets/pubs-jar-preview-sept-2010 (last viewed 14 Apr. 2011). 55. Ray B. Williams, "Is Social Networking Changing Tribal Behavior?" Psychology Today, 24 Jan. 2011, http://www.psychologytoday.com/blog/wired-success/201101/is-social-networking-changing-tribalbehavior (viewed 21 May 2011). 56. Pew Research Center, Internet & American Life Project, http://www.pewinternet.org/; Kaiser Family Foundation, "Daily Media Use Among Children and Teens Up Dramatically from Five Years Ago," 20 Jan. 2010, http://www.kff.org/entmedia/entmedia012010nr.cfm (both viewed 26 Apr. 2011). See also M. Ito, H. A. Horst, & M. Bittanti, et al., "Living and Learning with New Media: Summary of Findings from the Digital Youth Project," The John D. and Catherine T. MacArthur Foundation Reports on Digital Media and Learning, 2008; M. Ito, et al., Hanging Out, Messing Around, and Geeking Out (Cambridge, MA: MIT Press, 2009); E. S. Moore and V. J. Rideout, "The Online Marketing of Food to Children: Is it Just Fun and Games?" Journal of Public Policy & Marketing 6, n. 2 (2007): 202-220; E. S. Moore, "It's Child's Play: Advergaming and the Online Marketing of Food to Children," 2006, http://www.kff.org/entmedia/upload/7536.pdf (viewed 2 Oct. 2008) For an in-depth examination of the implications of the new media techniques on research, see Kathryn Montgomery, Sonya Grier, Jeff Chester, and Lori Dorfman, "Food Marketing in the Digital Age: A Conceptual Framework and Agenda for Research," 1 Apr. 2011, http://digitalads.org/reports.php (viewed 17 Apr. 2011). 57. AOL, "Three Screen Nation," 2009, http://advertising.aol.com/sites/default/files/webfm/research/AOL_Teens_Study.pdf (last last viewed 15 Apr. 2011). 58. Microsoft Advertising, "Understanding the Digital Youth Audience," http://advertising.microsoft.com/uk/reaching-youth (viewed 14 Apr. 2011). 59. Advertising Research Foundation, "The ARF 2011 David Ogilvy Awards," 22 Mar. 2011, http://rethink.thearf.org/pages/ogilvy_awards (last viewed 14 Apr. 2011). 60. Fico, "Success Story: Marketing," http://www.fico.com/en/FIResourcesLibrary/Coke_Success_2520CS.pdf (last viewed 14 Apr. 2011). 61. Lotame, "Case Studies," http://www.lotame.com/resources/casestudies/; IMC2, "Primer: DriveBrand Engagement through Facebook," http://www.imc2.com/pdf/library/DRIVEBRAND_Facebook_Primer.pdf (both viewed 14 Apr. 2011). 62. GfK Group, "GfK and Kantar Partner to Offer a Breakthrough," 27 July 2010, http://www.gfkamerica.com/newsroom/press_releases/single_sites/006273/index.en.html; GfK Group, "Cross-media Increases Sales Significantly," 17 Apr. 2009, http://www.gfk.com/group/press_information/press_releases/003844/index.en.html (both viewed 14 Apr. 2011). 63. A. C. Nielsen, "Understanding the Path to Purchase," Mar. 2006, http://it.nielsen.com/trends/documents/ESOMAR_Auto_paper.pdf (last viewed 12 May 2011). 64. Microsoft has established one of its "labs" for data mining and ads in Beijing; Yahoo's Bangalore facility in India works on "computational advertising"; and Google has an extensive global ad research apparatus that includes the funding outside scholars. 65. "Transparency, 'Brand Safety' Concerns Inhibiting U.S. Online Display Advertising Spending by as Much as $2 Billion Annually," 14 Apr. 2010, http://www.prnewswire.com/news-releases/transparency-brandsafety-concerns-inhibiting-us-online-display-advertising-spending-by-as-much-as-2-billion-annually-90824309.html last viewed 14 Apr. 2011). 67. See, for example, Center for Digital Democracy, U.S. PIRG, and World Privacy Forum, "In the Matter of Real-time Targeting and Auctioning, Data Profiling Optimization, and Economic Loss to Consumers and Privacy, Complaint, Request for Investigation, Injunction, and Other Relief: Google, Yahoo, PubMatic, TARGUSinfo, MediaMath, eXelate, Rubicon Project, AppNexus, Rocket Fuel, and Others Named Below," Federal Trade Commission filing, 8 Apr. 2010, http://www.democraticmedia.org/real-time-targeting (viewed 29 Apr. 2011); Center for Digital Democracy, U.S. PIRG, Consumer Watchdog, and World Privacy Forum, "In the Matter of Online Health and Pharmaceutical Marketing that Threatens Consumer Privacy and Engages in Unfair and Deceptive Practices. Complaint, Request for Investigation, Public Disclosure, Injunction, and Other Relief: Google, Microsoft, QualityHealth, WebMD, Yahoo, AOL, HealthCentral, Healthline, Everyday Health, and Others Named Below," Federal Trade Commission Filing, 23 November 2010, http://www.democraticmedia.org/sites/default/files/2010-11-19-FTC-Pharma-Filing.pdf (last viewed 15 May 2011). 68. Natasha Singer, "Privacy Groups Fault Online Health Sites for Sharing User Data With Marketers," New York Times, 23 Nov. 2010, http://www.nytimes.com/2010/11/24/business/24drug.html; IAB, "IAB Reports Full-Year Internet Ad Revenues for 2010 Increase 15% to $26 Billion, a New Record," 13 Apr. 2011, http://www.iab.net/about_the_iab/recent_press_releases/press_release_archive/press_release/pr-041311 (all viewed 14 Apr. 2011). 69. Advertising Research Foundation, "The ARF 2011 David Ogilvy Awards Winners and Case Studies," http://www.thearf.org/ogilvy-11-winners.php; Advertising Research Foundation, "The ARF 2011 Great Mind Awards Winners," http://www.thearf.org/assets/great-mind-11-winners (both viewed 14 Apr. 2011). 70 Center for Digital Democracy, "Digital Ads: Reports," http://www.digitalads.org/reports.php (last viewed 14 Apr. 2011).